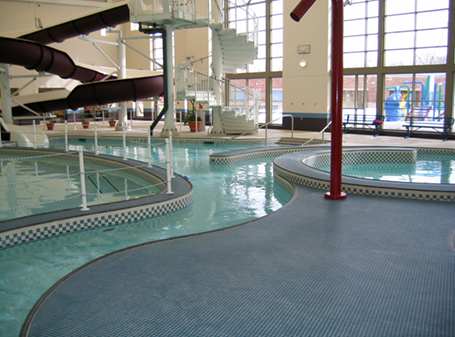 After performing a Feasibility Study in 1996 to determine the type of aquatic center the City of Solon should build, they again retained City Architecture, in association with Counsilman-Hunsaker, to move forward with designs of indoor and outdoor leisure pools for the Solon community. The indoor pool features a state-of-the-art computerized anti-drowning system called Poseidon, which aids the fully trained aquatic staff. In addition, the pool includes four lap lanes, a vortex, and whirlpool spa. With the waterslide and water playground, the outdoor pool also is designed with dump buckets, innovative squirt toys, and a one-meter diving board. Popular water features among the younger set include an elephant squirting water through its trunk and an inviting whale where tots can slide down its tongue. Other amenities include a spacious pool deck with nearly 200 lounge chairs, plenty of picnic tables, umbrella tables, and a large shade umbrella. An outdoor concession stand, rest rooms, first-aid room, and lifeguard office are also located on the pool deck.